The landscape of New York fighting has changed dramatically over the last thirty years. If you asked someone off the street in 1986 who the best fighter to come out of New York City was, the answer most surely would’ve been Mike Tyson. Now, as the rise of Mixed Martial Arts and the disciplines that compose it skyrocket into popularity like they’ve never been before, the answers vary. Old-school barbers and deli owners might still reference New York’s first love and rattle off boxers like Teddy Atlas, the great Sugar Ray Robinson, or the Cinderella Man, James Braddock. They were the ones that grew up in front of the radio, with their fathers and uncles crowded alongside them. Their grandfathers read A.J. Liebling’s work in The New Yorker and not chaptered off in anthologies like the sportswriting students of today. The concept of fighting in New York City still portrays an image of Madison Square Garden in black and white, lights shining up the sky, and a crowd of men and women dressed in dinner clothes and top hats huddled together. This identity of hyper-masculinity–the sheer animalistic urge to fight and hurt another human, as though this person solely represented the conflicts in your life that you must defeat to quench your own desire for glory–is still what many imagine fighting to be. In the city of the center of the world, it’s amplified ten-fold as the name Gleason’s carries the history of fighters such Muhammad Ali, Roberto Duran, and Jake LaMotta on it’s back. Vicious, powerful, relentless men, whose biopics are acted out by the biggest names in Hollywood and quotes are repeated by the fighters of today. As New York approaches its first anniversary of MMA’s legalization, a new generation of fighters are present and prepared to carry on the legacy of New York fighting. Just fifteen years ago, primarily boxing and fitness gyms were still heavily prominent in Manhattan and Brooklyn, catering to the businessman, the high school athlete, and the blue-collar worker. When other fighting sports were referenced, only a few names were known and they were clumped together indiscriminately without comprehending their legacy within their defined sport–Bruce Lee, Jean Claude Van Damme, even Lucia Rijker. Despite their talents in Jeet Kune Do, Karate, and Kickboxing respectively, they were simply known as action heroes and not so much as martial artists. Today, every few blocks is a Muay Thai or Brazilian JiuJitsu academy. Sometimes they are in the same place, also offering Krav Maga and Capoeira. If one is intrigued, they can learn Kali, which is Filipino stick-fighting, or the Chinese art of Tai Chi. The opportunities are nearly endless, and with that, the growth of New York fighters has increased dramatically. Every Friday or Saturday evening, a massive promotion such as the UFC, Bellator, or World Series of Fighting has a card, with local venues hosting the highly respected Ring of Combat or Cage Fury Fighting Championships nearby. Long gone are the days of watching boxing only a few times a year, via HBO or Showtime. Mixed Martial Arts has proven it has staying power, and the sports within it are of higher interest than ever. With the saturation of the athletes within these arts, how is it possible to acknowledge every fighter that puts their heart into it? A fight camp, even by amatuer standards, is by no means an easy path. The fighters sacrifice everything–including taking less hours at work to fit in more training, long periods of times away from loved ones, and adhering to strict fixed diets that provide both the fuel for the grueling workouts and just enough calories so they can lose pounds to fit in their weight class. 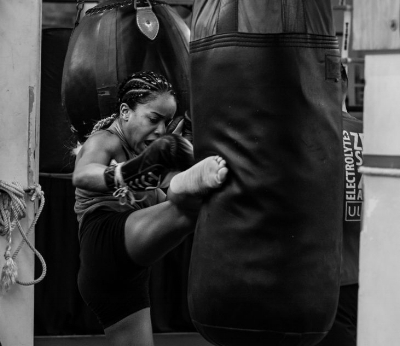 As various martial arts evolve and grow to highlight these elite-level athletes, new standouts are featured that boxing does not give much of a chance to: women. Just a few weeks ago, the incredible undefeated Heather “The Heat” Hardy was walked out at the Barclays Center to fight for an empty stadium–forced to put on a show before the doors were even opened, despite likely personally selling more tickets than any other fighter on the card. Heather Hardy’s name is nearly unanimous with women’s boxing, alongside the illustrious Alicia Ashley, Melissa St.Vil, and Alicia Napoleon. The world of boxing is lightyears behind the sphere of MMA, where women headline cards and dominate newsfeeds. Female MMA fighters are promoted much more, made accessible through today’s social media of Instagram and Facebook pages–things that didn’t exist through much of boxing’s lifespan. Even the non-fan knows who Ronda Rousey and Gina Carano are, and may even recognize names like Holly Holm, Cris Cyborg, or Sarah McMann. The ranks are continuing to develop as a diverse cast of women make themselves known–the Polish Strawweight champion Joanna Jedrzejczyk, the Brazilian Bantamweight champion Amanda Nunes who is the first openly lesbian fighter, and the UFC’s first African-American female fighter and notorious cosplayer, Angela Hill. Today’s female fighters don’t fit into the mold that is strangely still expected for women athletes–many prefer to be photographed without makeup, can trash-talk with the best of them, and are proud to sweat and get dirty. Sports are an epitome of the catalysts of change in the world, and today’s female athlete is represented drastically different than she would’ve been ten years ago. 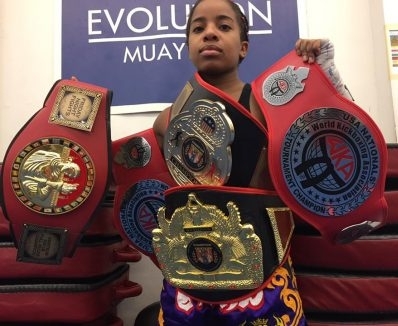 In the local ranks of New York, one such up-and-coming fighter is making a heavy name for herself–even though nearly everything about her goes against what is expected of women. Despite being petite, soft-spoken, and competing at 105 lbs (nearly 90 pounds less than the international representative of fighting, Muhammad Ali), Muay Thai fighter Raquel Harris carries the nickname of the most famous fictitious fighter of all time–”Rocky”. While Harris is ten inches shorter than the “Italian Stallion”, her heart is evident in every fight she has competed in. She’s small, but packs a hell of a punch. Unforgiving and vicious in the ring, Rocky shows no mercy to her opponents as she corners them with jabs and hooks. Her knees are so precise, it’s as if they have a tracking on livers and kidneys. Harris speaks in low tones, but when she is fighting, her voice vibrates powerfully in the venue. Her technique commands attention, and with it she impresses first-time watchers and veterans alike. On the street she appears harmless, but as soon as she gets gloves on it is clear–Raquel Harris is not a force to be reckoned with. The 25-year old fighter recently returned from a training trip to the mecca of Muay Thai–no place other than the sport’s original home of Thailand. “Rocky” is putting plenty of stamps on her passport due to fighting. 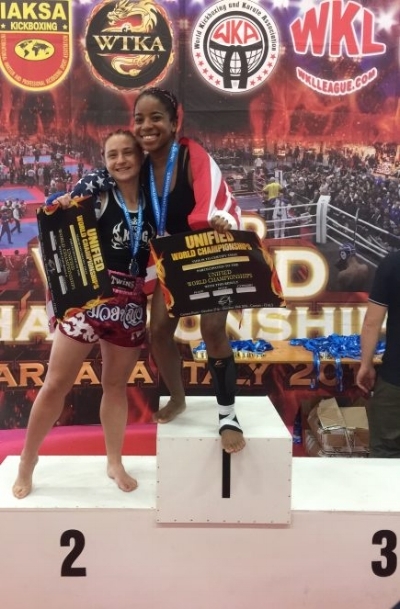 This past year she ventured to Italy, where she won WKA’s K-1 World Champion at 114 lbs, representing Team USA. With a record of 15-4 including Muay Thai and boxing, Harris is now preparing to transition into the world of MMA. These accomplishments have been a long time coming. Harris first started her martial arts career at the tender age of 15. Just like one of the greatest fighters in the world–Georges St. Pierre–Raquel began her journey with Karate and received her first Dan. She fell quickly into training, but wanted to find a sport with more active sparring. Within 5 years, she had her first-ever Muay Thai fight. 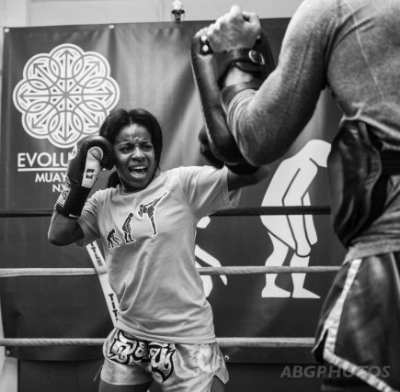 Feeling like she would thrive elsewhere, Harris decided to change camps and went to Invicta FC/UFC star Angela “Overkill” Hill’s academy Evolution Muay Thai on her invitation. The two had become friends via Facebook and Harris trusted the New York-based Strawweight enough to leave the academy where she had been for the last few years. Head coach and owner Brandon Levi was impressed by her and promised to make her a world champion, while “Rocky” ensured she would do whatever it took to make that happen. Both coach and student have held true to their words. Not one to give many compliments, Levi’s glowing accolades are shining stars to Harris’ training. Harris has been a cornerstone of the Muay Thai scene for some time, but now is looking to transition into MMA within the upcoming year. A career in Mixed Martial Arts can at times be unstable, but the opportunities are overflowing in ways that aren’t as recognizable in boxing or Muay Thai. Rocky feels complete with what she has accomplished in Thai boxing and is excited for this next facet in her journey. The dedicated athlete doesn’t mind commuting into the city several times a day or staying away from home for extended periods of time. Sacrifice means nothing to her in any aspect–if she has to give up things or work even harder for the love of the sport, she does so with little argument. Despite being born in Long Island, Harris moved to Jersey when she was in high school, where she has lived since. Like any other amatuer fighter, Rocky must work full-time in order to make ends meet, but she still counts her job as an “honor”. The next year will be incredibly busy for Raquel as she works towards her first MMA fight, growing her business, and now organizing all-female sparring sessions at her gym. Her first sparring event went well with various fighters coming in from all parts of the city to train up to sixteen rounds nonstop with other women.